I’m so excited that the days are getting longer and brighter, although as a ginger I can’t bathe in the sun’s rays too long for fear of turning to dust! 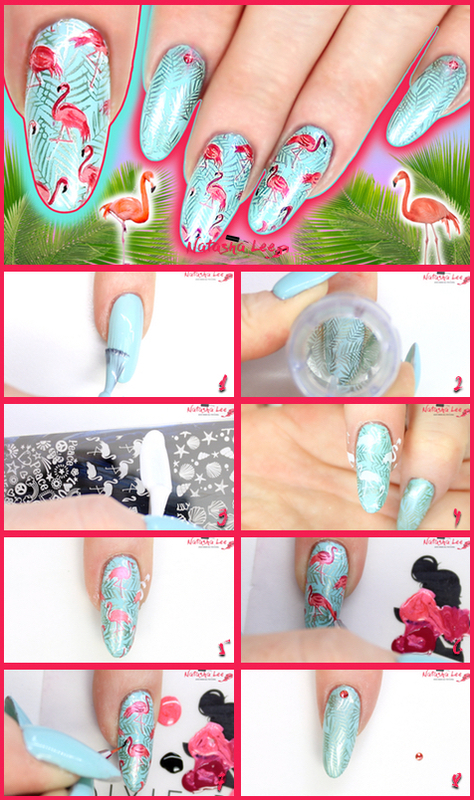 With being nominated for Best UK Nail Blogger at Scratch, I thought I’d give you a tropical flamingo nail art Step By Step this month in keeping with the Scratch Stars 2018 venue – the Tropicana Beach Club! Although this is a lacquer design, it will work perfectly with gel polish too. After applying basecoat (if applicable with your preferred system) apply 2 coats of duck egg blue lacquer, I used Essie Blossom Dandy. Using Dixie Plate Summer-01 and a pale green metallic polish like Models Own Green Chrome, apply the fern leaf full nail design to all 10 nails. For this entire look you are best using a crystal stamper to make placement easier. 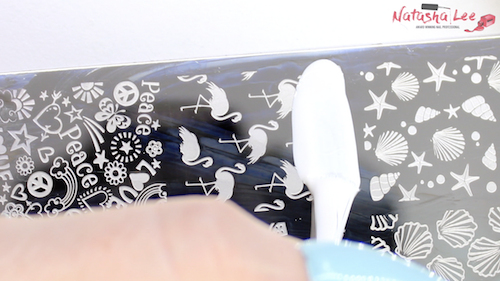 Clean your stamper between designs using a lint roller. 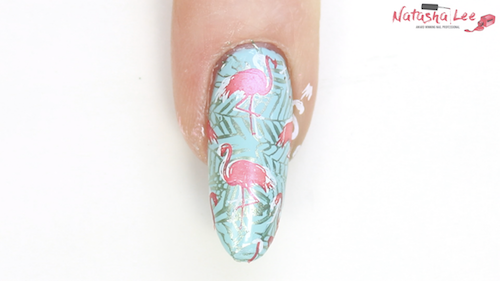 Apply a white stamping polish – I used Twinkled T Glow Up – onto the flamingo nail design, scrape the excess polish off and then transfer to your stamper. Apply the white flamingo design to your middle and ring fingers. 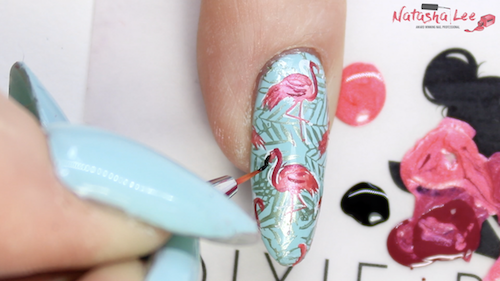 Repeat steps 3 and 4 but this time using a pink stamping polish – I used Hit The Bottle Watermelon Splash – and line up the pink flamingos to be just off set from the white to add a three dimensional effect and to make the pink flamingos really POP!! On a tile or pad, add some dark pink or red to your flamingo pink lacquer and mix. I used Moyou Sangria mixed with Hit The Bottle Watermelon Splash. Then using a fine detail brush add detailing to the flamingos on the head and down the neck, on the tail feathers and on the wings. 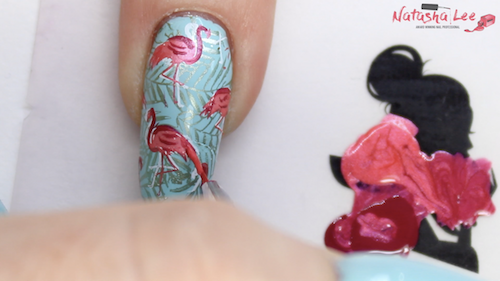 Using a black lacquer and your fine detail brush, add black beaks to all of the flamingos. Apply 2 layers of top coat to all of the nails (carefully floating it over the stamping designs to avoid the colours dragging) and then on the thumb, index and little finger apply an SS5 Indian Pink Swarovski crystal by the base/cuticle area of the nail. 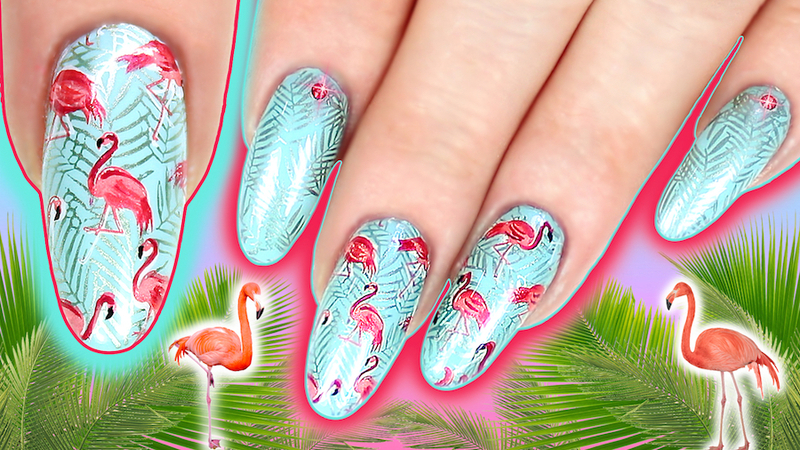 Your final flamingo nail art look is finished!! These look so intricate and yet they are so quick and easy to achieve both at home and on clients in the salon and they are simply perfect for the summer months and tropical holidays abroad!! If you like bright nail art designs then check out my Neon Rainbow Smoke Nail Art Tutorial.